Get a FREE Swiss Miss 3in1 Hot Cocoa Mix when you shop RCBC Bankard for at least P1,500 atLandmark or Sta. Lucia Supermarkets. Valid until August 31, 2015. 1. Promo period is from May 25 to August 31, 2015. Redemption is valid up to October 31, 2015.
s are active and current and in good credit standing. 3. To qualify, a cardholder must make a single-receipt purchase of AT LEAST Php 1,500 using his/her RCBC Bankard within the promo period and at any of the following participating supermarkets: Landmark Supermarket (Trinoma and Makati), Sta Lucia East Supermarket (Sta. Lucia East Grand Mall Phase 1 and 3). 4. For each qualified charge slip, RCBC Bankard cardholders can redeem for FREE three (3) sachet packs of Swiss Miss 3-in-1 Hot Cocoa Mix of these variants: Milk Chocolate, Dark Chocolate, Marshmallow. 5. 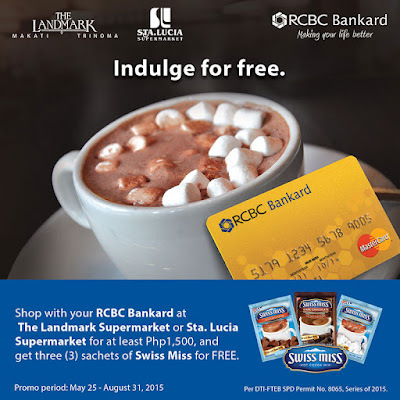 Cardholders may redeem free Swiss Miss from the RCBC Bankard sales booths or Customer Service counters located at the participating supermarket outlet where valid purchase was made and during regular store hours. 6. To redeem, a cardholder must present his/her RCBC Bankard credit card and original credit card charge slip (Customer’s copy) for proper validation at participating supermarket outlet. Cardholder information and transaction details on the charge slip must comply with the promo mechanics and must match with the RCBC Bankard credit card presented. 7. Redemption must be done at the partner supermarket where purchase was made. 8. Redeemed charge slip/s must be original and will be surrendered to participating supermarket outlet and may not be used anymore for other promotional offers. Cardholders may opt to photocopy their charge slip/s prior redemption, for their personal file. 9. Splitting of a single transaction for the purpose of generating multiple charge slips is not allowed. Redemptions from such charge slips will be deemed fraudulent. 10. Authorized representatives are not allowed to redeem. 11. RCBC Bankard reserves the right to charge the cost of the redeemable product to a cardholder’s RCBC Bankard should the latter cancel the qualifying transaction, or if the cardholder’s redemption is found to be fraudulent. 12. RCBC Bankard is not obliged to recognize or replace any unissued, misplaced, lost, stolen or faded charge slips. 13. Redeemable products under the promo may not be converted to cash, credited to RCBC Bankard or to any other product/s or promo offers available at participating supermarket outlet. 14. Any dispute concerning the free products shall be settled directly between the cardholder and the manufacturer, ConAgra Foods International, with assistance from RCBC Bankard.